A University of Oxford Professor of Economics and Public Policy on Wednesday urged Guyana to guard against lavish spending of oil earnings on consumer items which would result in a re-valuation of the Guyana dollar that would make other traditional exports noncompetitive. “If you spend it throwing a party in the economy on a lot consumption goods, you get appreciation. If you pay a lot of people a lot higher wages, you get an appreciation- that’s throwing a party,” Sir Paul Collier said. Speaking with senior journalists at the end of a one-day retreat that he and several other foreign experts had with select members of Guyana’s cabinet, Sir Paul said government should resist temptations to pay huge salary increases or sell cheap oil. “The vital thing there is that you just don’t have a big boom which kills all the other export sectors,” he said in referring to Sheffield, United Kingdom when oil prices had soared and wiped out all the other industries in four years. “It was a complete human tragedy,” he said. The key is to gradually build the required capacity to invest in a diversified economy, improved transportation, electricity and education. “You want a good investment that transforms people’s lives,” he said. Sir Paul recommended that the money should be “used predominantly for investment rather than for consumption” aimed at lifting people out of the poverty and providing for sustainable prosperity of future generations. One example of huge international capital equipment, he singled out, could be the purchase of electricity generating equipment that would increase supply in the economy. “What causes Dutch Disease and appreciation is when you try and spend on stuff that hasn’t increased in supply and drives the price up, that’s the appreciation,” he said. Extra cash, he advised, should be parked overseas in a Sovereign Wealth Fund. “Don’t feel shy to park money abroad for a while and bring it back in as you get opportunities to invest in,” he said. The Economist said he did not know how much would be Guyana’s net revenues from oil based on production of 500,000 barrels per oil. President David Granger addressing the the High-level Caucus on oil and gas. 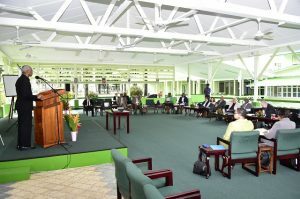 Acting Prime Minister, Carl Greenidge was quoted by government’s Department of Public Information as describing the high-level ministerial caucus on the oil and gas sector as an “exercise in realism” which addressed in detail the peculiarities of the sector and how the resources can be prudently managed. 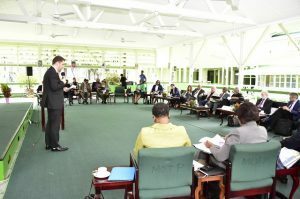 The ministerial caucus which featured presentations by a number of experts in the field, including renowned Professor Sir Paul, allowed President David Granger and ministers of government to grasp an understanding of what is happening in other countries around the world as it relates to oil and gas. According to Minister Greenidge the event provided a platform to hear “what the analysis by the experts is, about what to look out for, how to decide on policy. Minister of Natural Resources, Raphael Trotman said the event achieved its objective of having informal, uninhibited discussions with the experts on oil and gas governance, wealth resource management, sovereign wealth funds and effective communication with citizens. “How do we put aside suspicions about all kinds of backdoor deals and so forth, so it was good for us to talk amongst ourselves, it was good for us to talk to experts about what obtains elsewhere and to realise also that we are not too far off the radar or that we are in no different place from other countries two years after a discovery was made,” Minister Trotman explained. The Ministry of the Presidency further quoted Trotman as highlighting a number of priority areas for the Government such as, poverty eradication, development of hydroelectricity and solar farms, palm oil farms and agriculture in the pursuit of reclaiming the country’s position as ‘breadbasket of the Caribbean’. “I believe we have suffered from diminished confidence that we are less than capable of managing what is to be bequeathed and shared with us. We need a synthesis of ideas that form themselves into a practical and attainable plan of action… We don’t have to wait on production to see the benefits of petroleum and so I suggest we start at a 20-year vision and plan. Where should we be by 2035? And what must we do to achieve this? What steps should be taken?” the Minister said. The core objectives of the forum, which was held at the Baridi Benab at State House, were to build awareness on key issues relating to the oil sector; frame the country’s strategic choices to each of the key issues, to align those choices and to provide a blueprint for a sector roadmap. It brought together a mix of international and local experts on natural resources, governance, fiscal policies, finance and economic development. During the deliberations, there were recurring themes such as economic diversification, education, technology and infrastructural development, all of which were identified as priority areas to be pursued in order to transform the country’s socio-economic landscape. President Granger pointed to the need for legislation and strong oversight institutions to protect citizens from the adverse aspects that could flow from the exploitation of this resource. “We need to mobilise, not only national will, but national resources. This is going to be the single largest industry in Guyana. As a country of just about three quarters of a million people, we need to ensure that our resources are mobilised so that every Guyanese understands the importance of petroleum… We have to protect the rights of investors by establishing the institutions to ensure that there is no abuse or misuse of this resource. Without the institutions, without the judiciary, without the oversight by the National Assembly and without prudent management by the Executive, much of what we are attempting to do will fail,” the he said. The Guyana government recently announced that the oil and gas sector would later this year be shifted from the Ministry of Natural Resources to a Department of Energy that would be set up at the Ministry of the Presidency. A ministerial task force has been established to oversee the formation of that Department.